Doctor Who: Why The Cybermen Outrank The Daleks | Warped Factor - Words in the Key of Geek. Tony argues for the Cybermen to take pole position. 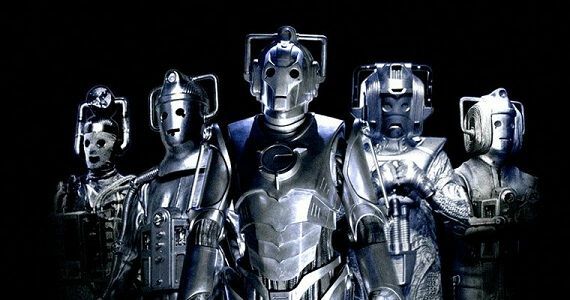 The Cybermen are frequently thought of as Doctor Who’s Silver Medal Villains, the second mega-hitters in the show’s history and, next to the Daleks, Who’s creepiest, most successful returning villains. 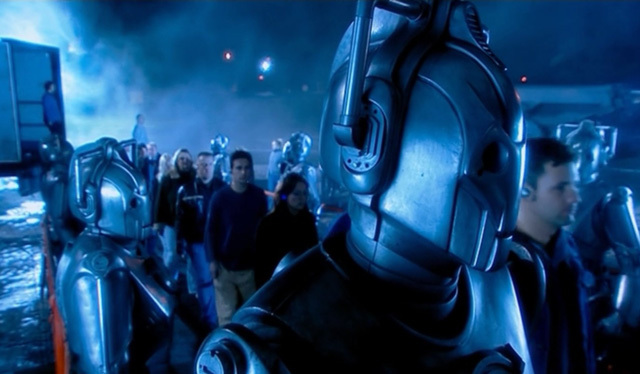 Here’s the thing – to me, the Cybermen will always be scarier than the Daleks. More interesting than the Daleks. In short, and there’s no other way to put this, better than the Daleks. It is of course quite hard to explain why that should be so – the Daleks turned Doctor Who from an interesting programme that went on to be about cavemen into must-watch TV. Their second story expanded their potential hugely, and remains an all-time classic, their design is iconic, their voices still have the potential to scare the bejesus out of children, no matter how old they are, and philosophically, they’re a combination of Nazism, atomic horror and the screaming ego of a five year-old with a gun. What have the Cybermen got that competes with that? Firstly, the idea of the Cybermen is much scarier. Yes, the Daleks are ‘bubbling lumps of hate’ in bonded polycarbide suits of armour, but they never had a choice about that. They were ‘born’ that way, manufactured to be a laughable lesson in ‘perfection,’ and sent out into the universe to give the rest of us a cosmic kicking. You, me, all of us. The Daleks might hate every non-Dalek thing in the universe, but the Cybermen were frightened. 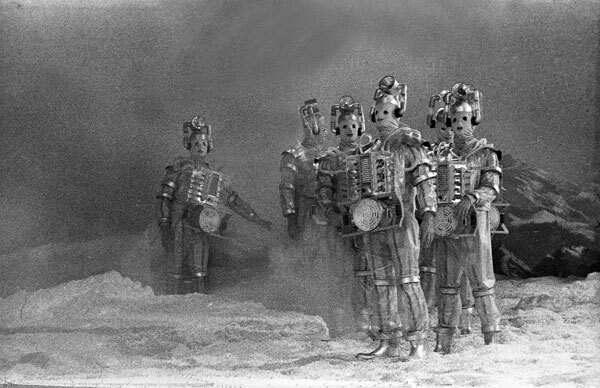 Oh they can witter on open-mouthed about having to amend their form to survive in the wastes of space as Mondas froze on its way round the block, but Kit Pedler, who first had the idea of the Cybermen, built them from a concept of fear. He was afraid that the more we replaced ourselves with artificial mechanisms, the less human we’d become, and so he made the Cybermen afraid. Afraid of all the things you and I are frightened of in our pathetically short, squishy, organic, emotion-driven lives. They were frightened of ageing. Of decrepitude. Of a loss of memory and function. Of going blind, or deaf, or mad. Of the frailty that comes with getting old. And of the ultimate consequence of time – of death. Mondas was not casually chosen as the Earth’s ‘twin’ planet – it was pure science fiction allegory. The Mondasians were us, with better medical facilities. At least they were in the Sixties. Now, it would be fair to say we’re just about starting to catch them up – bionic arms and legs are starting to be 3D-printed and they’re changing lives. And that’s the scary thing. The Cybermen began with such good intentions, and the replacement of limbs and organs is unquestionably a good thing for those who lack them. But Pedler feared that the more we augmented ourselves, the more our ability to do so would slide from necessary to easy, from surgical to cosmetic or functional, to elective. The idea of upgrading ourselves not because we lack anything in nature, but because the mechanical alternative is better is how you get from where we are right now to the Cybermen. And as Russell T Davies was quick to point out when he took on the task of bringing the Cybermen back in New Who, we are a culture obsessed with gadgetry and gizmos, the latest cool upgrade and the race to be the same as everyone else, to be socially equal. If there’s a killer app, we all have to have it. A killer game, we all have to have it. The most bells-and-whistles phone, it’s in our pocket, transforming how we spend the time of our lives. Imagine if there was an affordable technology to upgrade your eyes, so they’d replay anything you saw, any time you wanted, straight to your brain. Imagine a slot at the back of your neck, a chip that would give you mental access to Netflix at the speed of thought. Imagine a cyber-nanite pill that could eat excess fat. Reprogram muscle to grow. Rebuild neuronic pathways. Imagine you could download your entire mind to the cloud, seamlessly, every ten minutes, for rebooting in the event of accidental damage. Imagine you could retard the ageing process, be young, be strong, be desirable forever. Which of us wouldn’t take any of those elective steps on the pathway to the Cybermen? Now imagine every heartbreak you’ve ever had. Every death you’ve grieved for. Every love spurned. Imagine all the rage of passion and politics, of argument, of knowing that you’re right and someone else is wrong. Imagine all the pain of knowing others are suffering, and you can do nothing to help. That you can’t save those who die of famine, those who flee from war, those whose parents beat them, those who find the streets a safer bet. You can do nothing to help any of them. Then imagine you could take all that pain, all that passion and heartbreak and impotence, and you could flush it, cool as lemonade from your brain. How much easier would your life be without the burden of a conscience, without the need to care? How attractive would that be? 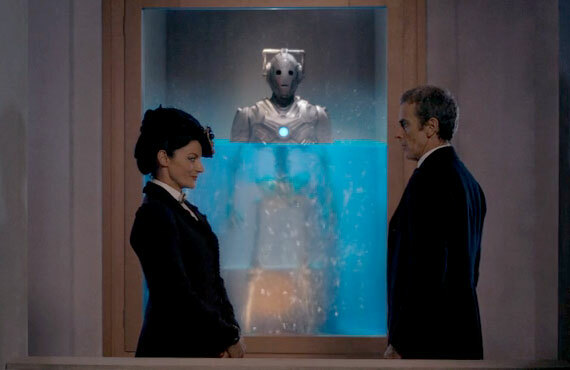 The Cybermen are us if we take the easy option, if we delete the painful parts of being alive because they hurt. The Daleks are screaming Nazi children in tanks, sure, but there’s something altogether more heartbreaking about the Cybermen, and especially about their certainty that their way is better. Then, beyond the heavy philosophy of the Cybermen, there’s their aesthetic. The Daleks and Cybermen might both be former humanoids encased in metal and kept alive by artificial systems, but the Daleks don’t look like they were ever us. 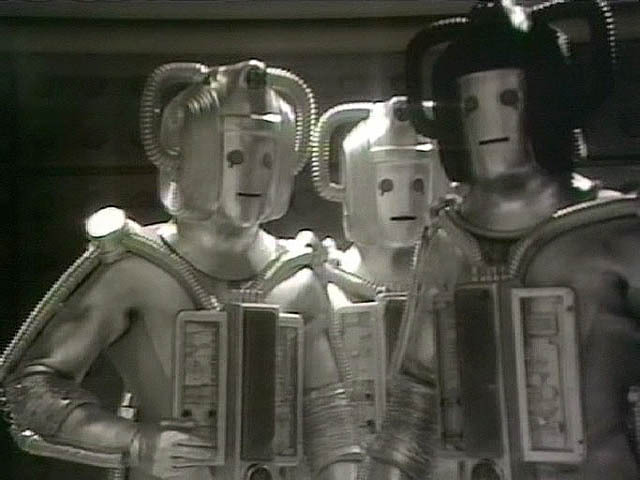 The Cybermen, in all their forms – from the mummified Tenth Planeters to the metallic Troughton variants, and even up to the current, somewhat cherubic mostly-androids - look humanoid. Their eyes and mouth are in the same relationship as ours, their arms and legs are like ours. The fact of their former humanity is inescapable – as is the fact that with their expressionless faceplates and their synthesised voices, they’ve lost the last scraps of that humanity to their fear and their need to survive. That aesthetic of lost humanity, that blankness coming from something that we instinctively feel should be like us, makes the Cybermen more imposing, more terrifying than the sons of Skaro. Then there’s the variability of their use. While the Dalek shadow is thrilling when thrown against a corridor wall, there’s no such thing as a stealth Dalek. Or rather, there is now, in terms of the humanoid Dalek agents, but there hasn’t been until very recently. Cybermen were doing the scary shadow thing as early as The Moonbase too, but they could also hide as humans in a hospital bed! They had plans that were deeply (in fact, some would say impenetrably) sneaky as far back as The Wheel In Space, and they’ve done everything from poisoning staff on a space station to send the survivors to blow up a planet, to crashing a shipful of themselves into the Earth, to altering the course of Halley’s comet to stealing children from a theme park and turning the Doctor into one of them. The Daleks have had some whacky schemes in the past too, it’s true, but for sheer, madly illogical logic, you can’t beat the Cybermen. That the Cybermen’s storylines have for the most part been screamingly illogical has served to downgrade them in our minds – there are maybe three TV Cyber-stories that really work in terms of logic, and they’re probably not the ones you love. But they can work, and have been shown to work, in audio stories, in novels, in comic-books. That they’ve rarely been used to their fullest advantage on screen is not the Cybermen’s fault. It’s the fault of the fact that the Cybermen, used to their fullest advantage, give you very little option but to kill or be killed, and that doesn’t leave a lot of room for the Doctor’s usual heroics. Shoot a Dalek in the eyestalk, it’ll freak the hell out and probably self-destruct. Shoot a Cyberman in the eye, it’ll keep on coming and kill you before you get another shot in. *Although hopefully it also takes them to a scarier, less adorable faceplate again. Just saying. Cyber-cuties – ick.